It's time for a new post!Today's card is a lovely card I made for my swap partner over at Challenge Card Swap on Facebook. I love Altenew stamps and I hope to add a few more sets to my stash in the future. These flowers are so pretty and I had to use them for this card. For the embossing, I decided to use some glitter embossing powder for that extra touch . Also, I like to use the NUVO drops from Tonic Studios to add some finishing touches, if I don't have the right sequins. I hope you will take a look at our group and join. Any cardmaker is welcome. We will have a new swap coming in the first day of May. I'm excited to share today's cards, using the ''Thankful'' kit from Crafty Ola. I really enjoyed working with this kit and I love the results. The colors are so bright and cheerful. So, as always I have five cards to share with you as inspiration,if you want to get the kit or you already have it by the time you see this post. I really liked the die cuts, stickers and pattern paper. You will see that I used those the most. With such beautiful embellishments, you don't have to put much effort in making the cards. To not miss a great kit, please make sure you check Crafty Ola Store. These cards will find a home soon, because I plan to send more cards this year and as cardmaker I can always make new ones,plus I need extra space to keep everything. So,they will have a new home very soon. If you like today's post, please let me know in the comments below. As always, thanks for stopping by! 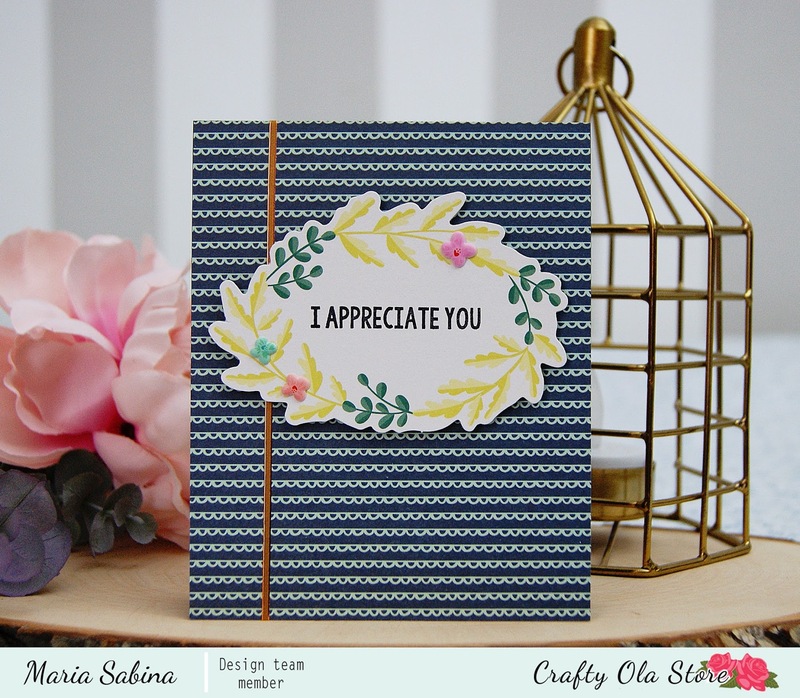 I'm super excited to share the sneak peek of the upcoming kit ''Thankful'' from Crafty Ola. 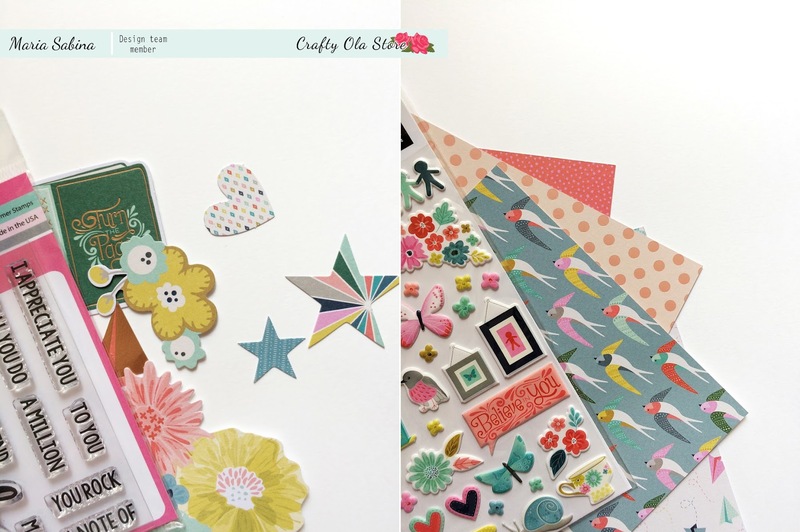 I love every single bit of it and I can't wait to show you the cards I make using the kit. It's fresh, colorful, beautiful designs and probably my favorite one so far. You can keep an eye on their website and upcoming projects. Also feel free to check out their facebook page for great inspiration . 'till next time, stay safe and create beautiful things! I hope you are doing well. Today's creation is going to be different than my usual posts. 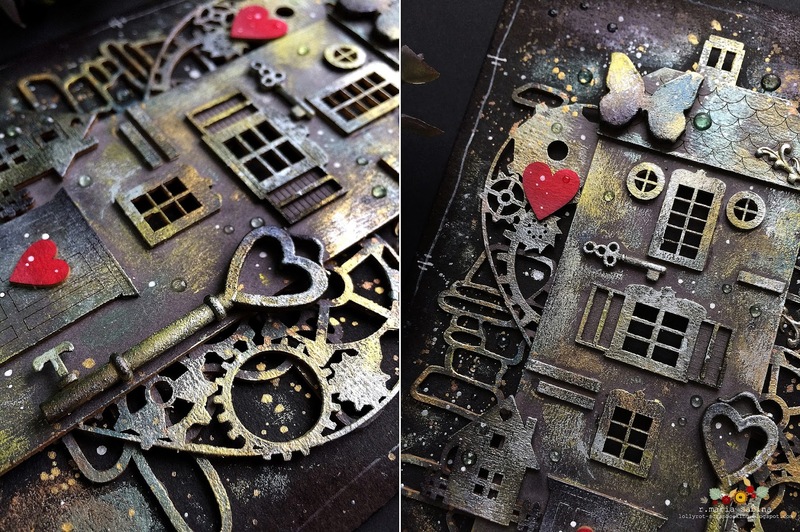 I thought it would be fun to create a mixed media page,using chipboards from Scrapiniec. I love making cards, but sometimes I like to try new things and mixed media is something that I don't really get to do that often. However, I'm super happy with the result and I hope you like it as much as I do. To add color and texture to the chipboard elements, I used NUVO mousse from Tonic Studios. I also used a sanitary glove to apply the mousse,because it works much better than using your finger or a brush. Plus is less messy. In mixed media you don't have rules. You can be as messy as you want. 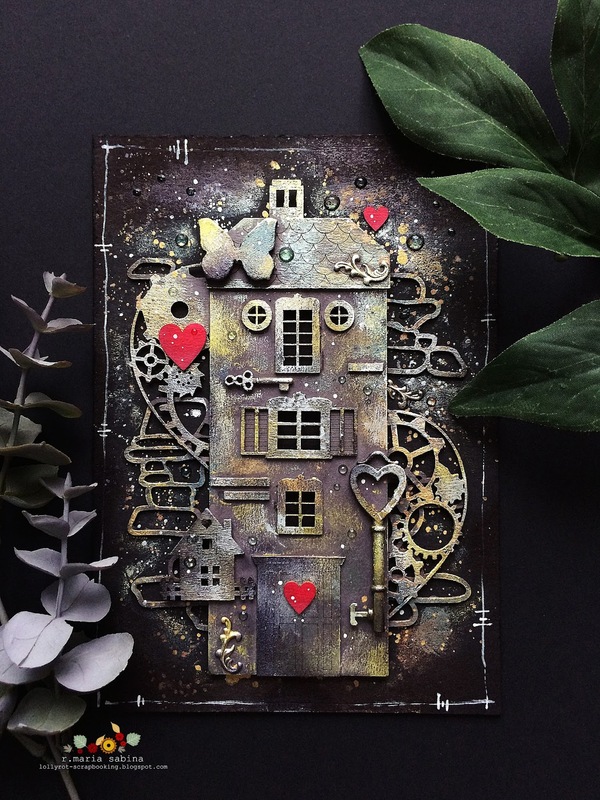 If you are looking for inspiration, then you can find more work over at Scrapiniec blog. We have a wonderful and talented team. For my card I got inspired by a fairy garden. I used NUVO markers to color the chipboards. My advice is to use paints that are not super wet ,because you can damage the chipboard. They are super fine and really detailed. I love them! You can use them as they come, but I think a bit of texture and color will make them more beautiful. 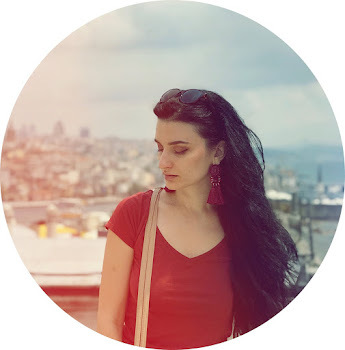 I can't wait to experiment more and share the results with you all.If you are looking for inspiration and more products, please visit Scrapiniec. This weekend I will be celebrating Easter. If you do it too, then I wish you a very Happy Easter to you and your loved ones. Enjoy your day and stay safe! It's a new month! Wow! Time really flies and I feel like nothing productive is happening. However, things are moving on and I have another five new cards to share today. This time I used a special edition kit from Crafty Ola Store called ''Just for you ''. The pattern paper is stunning! It reminds me of the oriental tiles. They are so beautiful and detailed. Because the pattern paper is super busy, I tried to keep the cards simple by adding small accents and sentiments from the kit. I really enjoyed creating the cards and I think they will find a nice home very soon. As always I have a little helper around. She's my neice and she likes playing around with my things. If you like today's cards then you can check out the other kits from Crafty Ola Store. If you want to share your creations then please join the Facebook group.